5/12 Cup of Coffee: All four games on Sunday had exciting finishes, with Pawtucket and Portland winning in their last at-bats and Salem bringing the winning run to the plate in the ninth. Matt Barnes had another great start, Travis Shaw blasted his sixth home run, Mookie Betts reached base four times, and Forrestt Allday continued to be a welcome addition to the Drive. Corey Brown hit a solo home run in the top of the ninth to lift the PawSox past the Louisville Bats (CIN), 3-2. Matt Barnes continued his excellent start to the year, going seven innings and allowing only two runs, walking one, striking out three, and inducing 10 groundouts. Rich Hill picked up the win while pitching a scoreless eighth inning, and Drake Britton notched his fourth save with a perfect ninth. Brown started the scoring off with a single in the second inning, scoring Bryce Brentz who went 2 for 3 with a walk. Brown then won the game with his fourth home run of the season, but third in the last 10 games. After a slow start to the season, Brown is batting .188/.289/.438 in his last 10 games. Christian Vazquez and Mike McCoy each went 2 for 4, with McCoy adding a double. Portland scored four times in the bottom of the ninth to walk off with a 13-12 victory over the New Hampshire Fisher Cats (TOR). Portland jumped out to a 5-0 lead after two innings, with Travis Shaw, Mookie Betts, and Carlos Rivero each hitting run-scoring singles. New Hampshire stormed back, scoring seven times in 4 2/3 innings off of starter Miguel Pena, and then five more times in two innings off of Mike McCarthy. With New Hampshire leading 12-9 heading into the bottom of the ninth, Portland had the right guy leading off, as Betts walked to start the inning. Deven Marrero and Travis Shaw followed with a walk to load the bases, then Rivero drove in two with a single to put Portland down one. Henry Ramos tried a sacrifice bunt to put the winning run in scoring position, but an error by the first baseman allowed everyone to reach base to load the bases again. Matt Spring followed with a sacrifice fly to tie the game, then Heiker Meneses won it with a single. Betts went 2 for 4 with two walks, Marrero went 3 for 4 with a double and two walks, Shaw went 2 for 4 with a home run and two walks, and Rivero went 3 for 5 with a walk. Eight of the nine starters reached base at least twice in the game. Salem mounted a late comeback, but it was not enough, as they fell to the Carolina Mudcats (CLE), 7-5. Pat Light got the start and was not sharp, walking three and surrendering four runs, two earned, in five innings. He only struck out one and gave up six hits. Justin Haley went the next 3 1/3 innings, keeping the Mudcats off the board until the ninth, when they got to him for three runs while he recorded only one out. Those three runs in the ninth were crucial, as Salem scored three runs of their own in the bottom half of the ninth. The first four batters reached base, with Ryan Dent plating a run on a single. Jonathan Roof drove in a run with a groundout, and Tim Roberson followed with an RBI single to put the tying run on base with only one out. With runners on first and second, Reed Gragnani grounded into a double play to end the game. Roberson went 3 for 4 with a walk, while Roof and Matty Johnson each had two hits to lead the way. Greenville won a back-and-forth game against the West Virginia Power (PIT), winning 9-6. Teddy Stankiewicz went the first five innings, allowing three runs on seven hits, walking two and striking out four. He left with a one-run lead, but the Power got to John Ely for two runs in the sixth to take the lead. Greenville responded by scoring four times in the bottom of the inning to retake the lead, and Jonathan Aro was able to hold them off over the final three innings to earn the save. Forrestt Allday led the offense, going 3 for 3 with two doubles and two runs scored. Jimmy Rider went 2 for 3 with with a double, a walk, and three runs scored, and Jantzen Witte went 2 for 4 with a walk. 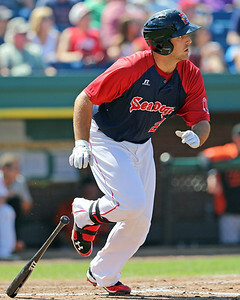 Player of the Day: Travis Shaw was on base four times and slugged his sixth home run in a Portland walk-off win. Shaw, who is repeating Portland after a tough season in 2013, has made drastic improvements this season, and he is now batting .295/.399/.500 in 122 at-bats. The 24-year-old first baseman started to turn things around in the Arizona Fall League in 2013, batting .361/.452/.705 in the offensive-friendly environment, and he has carried that success over to 2014.